TSP-Infinity Trading - Tucson Showplace, LLC. With over 10 years experience in the fossil and mineral industry, Infinity Trading offers top-quality fossils to the collector and enthusiast. What makes us unique is our ability to identify a high quality fossil, the knowledge of finding and preparing fossil properly, and our ability to display a fossil in a way that it becomes a work of art. When our fossils leave our gallery, they are ready to be displayed and enjoyed. Aissa Aaronson is the visionary behind Infinity Trading. Mentored by industry experts who instilled in him the passion for fossils and an eye for immaculate quality. 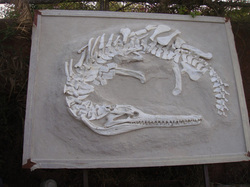 These experiences and his artful eye are what allows him to create a work of art out of an unearthed prehistoric fossil. This unique vision is what makes Aissa's fossil creations some of the most sought after collector pieces in the world. Aissa knows you will agree that these fossils are works of art. He guarantees that his fossils are of superior quality and will take them back if you are unsatisfied.